So I'm doing a research on developing a new text-based CAPTCHA system. I've devised a scheme where characters in a text are broken/split individually and randomly, making it difficult for OCR machines to decode it. (See figure for example) This CAPTCHA is still under development, but it gives a rough idea of what I'm talking here. 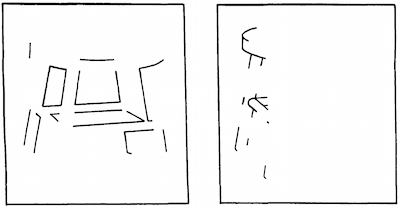 My main aim here is to understand how the brain reads scrambled characters, as shown in the figure. I was looking up and a term called "filling-in" phenomena of vision came up. I'm not sure if that term is right in this context. I want to know the terminology and basic understanding of how humans are able to read scrambled text/characters easily. 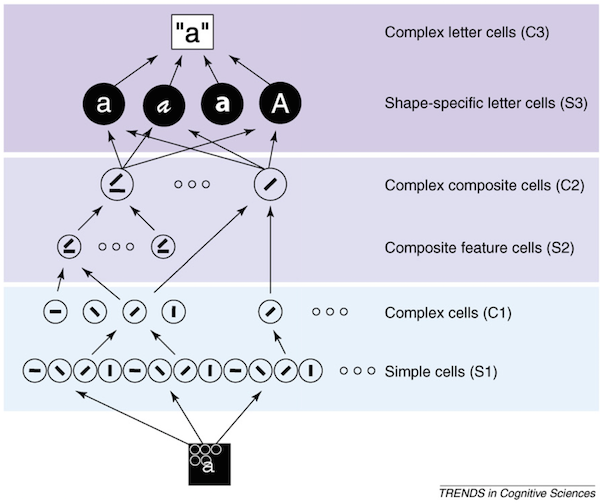 A human brain recognises letters by their constituent features (sub-letter parts). It is modelized by a pandemonium model where printed information is extracted locally then globally. In the letter recognition literature, this type of feature-based hierarchical model competes with template matching theories (with an advantage to the pandemonium-like models such as deep-learning networks). if an arrangement of two or three sub-components can be recovered from the input, objects can be quickly recognized even when they are occluded or extensively degraded. Could you identify the following object? Left is the unrecoverable version. Grainger et al (2008). Letter perception: from pixels to pandemonium. Trends in Cognitive Science. For example, when an individual understands that the first letter of a CAPTCHA is an “a”, that individual also understands where the contours of that “a” are, and also where it melds with the contours of the next letter. Additionally, the human brain is capable of dynamic thinking based upon context. It is able to keep multiple explanations alive and then pick the one that is the best explanation for the whole input based upon contextual clues. This also means it will not be fooled by variations in letters. Essentially it boils down to two factors: one, humans are preprogrammed with 'object recognition' abilities. Two, humans are able to parse a string of symbols in a way that conforms to the rules of a formal grammar. Object recognition is the ability to find and recognize and identify human objects in a sequence. Humans naturally have this ability, whereas computers do not. It appears to be a genetic quality, and can be replicated in computers by genetic algorithms that mimic the process of natural selection. Within ERPs, P600 is the most important component. Its activation occurs when the parser comes across a syntactic violation such as The broker persuaded to sell the stock or when parses synthesizes an unsatisfactory disambiguation on an ambiguous string of words such as The Doctor Charged the patient was lying. Hence the activation of P600 marks the parser's attempt to revise the sentence's structural mis-match or ambiguity. It also appears that the presence of a disfluency in a sentence—caused by filled and long silent parses—does not elicit the P600. Instead, it elicits another ERP component, N400, which gets activated when people try to integrate a new word into the preceding sentence's context. Based on the above, it appears that the brain has specific event-related potentials that intuitively activate during specific situations while parsing. In other words, a human can recognize familiar sentences and words intuitively, and when it comes across an unrecognized word, it attempts to integrate it based on context. Since computers do not currently have a similar intuitive ability, CAPTCHAs are harder for them to decode. Not the answer you're looking for? Browse other questions tagged cognitive-psychology perception cognitive-neuroscience vision artificial-intelligence or ask your own question. What study showed that humans can successfully detect objects within images once they are able to recognize those objects?